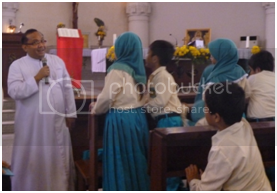 On October 1 st, 2011, the students of the ICP went to the holy places of religions in Semarang. There are Masjid Agung Jawa Tengah (MAJT), Blenduk Church, Sam Poo Kong, and Pura in Akpol Semarang. The students are divided into five groups. 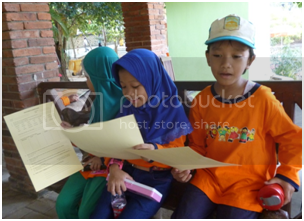 There are group 1 is acccompanied by Mr. Nanang. 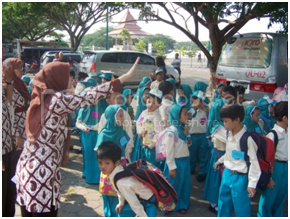 The group 2 is accompanied by Mrs. Riza. The group 3 is acccompanied by Mrs. Anik. The group 4 is accompanied by Mrs. Ika. And the group 5 is accompanied by Mrs. Ida. Every group consists of 10 (ten) students. The first time, they went to Masjid Agung Jawa Tengah (MAJT). In MAJT the students studied about the holy pace, the holy day, and the holy book of Moslem. Mr. Warsito and his staff welcomed the students. Mr. Warsito is one of the sustainer of Masjid Agung Jawa Tengah. His staff explained about the history of Masjid Agung. Further he said that MAJT is holy place for Moslem in Central Java. Besides that, the students studied about the holy day and the holy book of Islam. 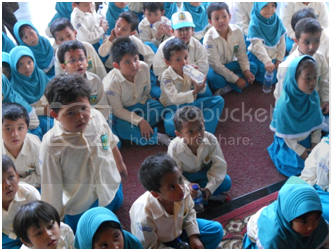 The students knew that the holy day of Islam is Idul Fitri and Idul Adha, whereas the holy book of Islam is Alquran. When the students studied in MAJT, they were very happy. After studied, Hafis, one of the student of class ICP, gave Mr. Warsito a placard of SD Hj. Isriati. After the students went to MAJT, they went to the Blenduk Church. The Blenduk Church is one of historical building in Semarang. The Blenduk Church is holy place of Christian. This building was created by Holland. In Blenduk Church the students learned about the holy place, holy day, and holy book of Christian. On of the sustainer of Blenduk Church said that Blenduk Church is the holy place for Christian in Semarang City. Further he said that The Christian had the holy days which are Christmas and Paskah. The Christian also has the holy book which is the Bible. After the students learned about something in the Blenduk Church, now they know about the holy place, the holy day and the holy book of Christian. Before leaving the Blenduk Church, one of the students class I ICP gave the placard to the sustainer of Blenduk Church. Field trip in Blenduk Church finished. 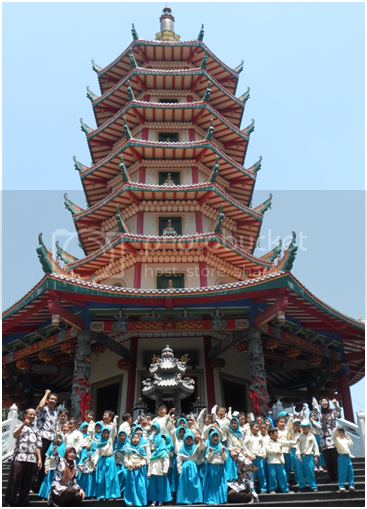 The students went on their trip by the bus, to the Sam Poo Kong in West Semarang. The third trip, the ICP students went to Sam Poo Kong. The Sam Poo Kong is the name of Klenteng. And the Klenteng is the holy place of Kong Hu Cu. This building is not only as the holy place of Kong Hu Cu, but also as a famous tourism place in Semarang. In The Klenteng Sam Poo Kong the students saw the red building, like China building in China Country. So this building was built by China ethnic, because most of the followers of Kong Hu Cu is China ethnic. In the Klenteng Sam Poo Kong the students of ICP learned something about that place. They also learned about the holy day, and the holy book of Kong Ho Cu. After students of ICP got something about the Klenteng Sam Po Kong, they know that the holy place of Kong Hu Cu is Klenteng. The holy day of Kong Hu Cu is Imlek or Cap Go Meh. And the holy books of Kong Hu Cu are Wujing and Sishu. After the students learned at the Sam Poo Kong, they went to Akpol to continue their study. At the end of trip of ICP Classes, they went to Pura. The Pura that they visited is in Akpol area (Police Academic Area). The Pura is the holy place for Hindu. Mr. Ngatmo welcomed the students. He is a lecturer of Police Academic. 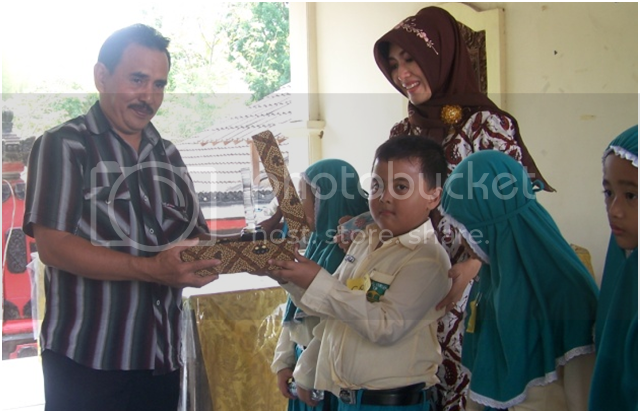 He is also one of sustainer of Pura in Akpol. At the Pura the students of ICP learned something about Hindu religion. According Mr. Ngatmo that the Pura is the holy place for Hindu. He also explained them obout the holy days and the holy book of Hindu. The students seriusly paid attention to Mr. Ngatmo explaining. So, the student know the Hindu is one of legal religion in Indonesia. They also know that the holy days for Hindu are Nyepi and Galungan. And the holy book of Hindu is Weda. After the students learned with Mr. Ngatmo, they had a break for a moment. They had lunch together there. After finishing their lunch, they wanted to back to the school. Before they leaved The Pura, one of the students of ICP gave the placard to Mr. Ngatmo. All of the students gave applause together. They shook hand with Mr. Ngatmo, and then backed to school. In the school their parents waited them. Recently 1st grades of ICP of SD Hj. 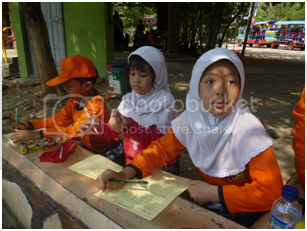 Isriati held out door learning activities. The activity was held in the framework of contextual learning. In this study, some subjects are presented thematically. 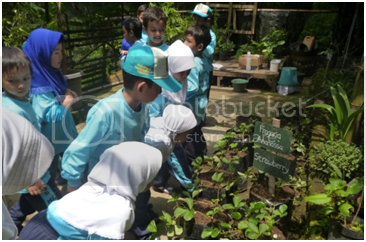 While the learning process carried out with field trips. Field trip this time is the first field trip for grade 1 of ICP. On the occasion, the students learn about religious harmony. Therefore, students are invited to visit the places of worship in the city of Semarang. The aim is that children can explain the names of places of worship, the names of the other religious scriptures, explaining about the great days of other religions, and the religious leaders said. Thus, children can appreciate and respect other faiths. Place first field trip the students visited was the Cathedral Church. There, the students were greeted by Father Aris. Father Aris explained to the students about the great days of the Catholic religion, Catholicism Scripture, Catholic leaders and Catholic church. The students enjoyed listening to the explanation Father Aris. They were given the opportunity to ask questions. The students were eager to ask everything they see there. Some children were asked the difference between Catholic and Christian religion. Father Aris also explained wisely. After studying with Father Aris, the students learned that the place of worship of the Catholic religion called the Church, the holy Catholic Religion is the Gospel or Bibel, the Catholic religious holidays are Christmas and Easter, and Catholic religious leaders is a Priest, Bishop, or Pope. 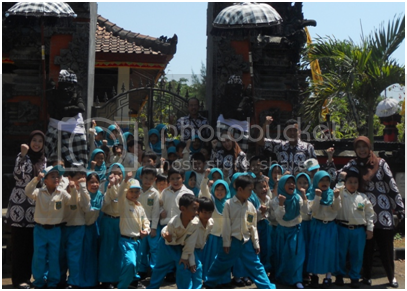 The last field trip of ICP grade 1 is to Monastery (Vihara). Monastery is a place of worship for Buddhists. 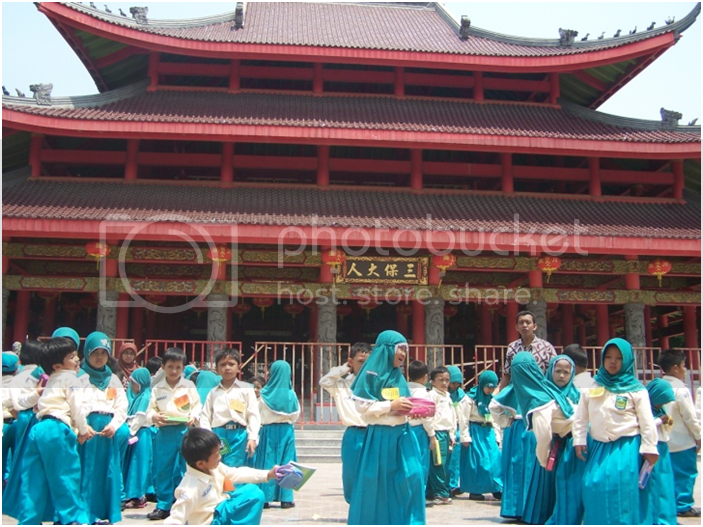 At that time, the students visited Watu Gong Vihara in Semarang. There, the students had been awaited by the board Vihara. At about 11:00 pm, the group learned grade 1 of ICP arrive in the Vihara. Their arrival was greeted by Mr. Budi. Mr Budi happy to meet with them. They were admitted to the room with the statue of the Buddha. The students were happy to be in that room. In addition to the sculpture displayed, there are some ornaments that interest them. 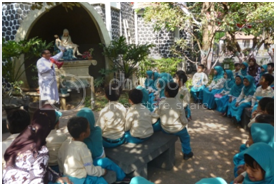 Once they are in a condition to sit quietly, Mr Budi immediately explain the monastery (Vihara) and about Buddhism. According to Mr Budi, Gautama Buddha was the founder of Buddhism. Buddha is a saint who received revelation from God Almighty. Then he taught the eight paths of righteousness. 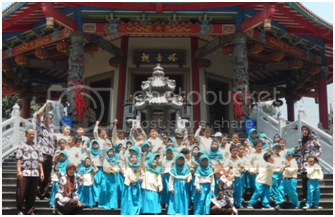 Pak Budi also explained that the place of worship is a temple or Buddhist Pagoda. He also explained that the holy book of Buddhism is the Tripitaka, and the feast of Buddhist isVesak (Waisak). After illustrate Pak Budi, the students take a short break for lunch. After lunch, the students invited to the Pagoda. At the Pagoda Pak Budi explains everything there. There are statues of Goddess Kwan Im, statue Cheng Ho, and so on. At about 12:30 pm field trip activities completed. The students returned to school with satisfaction, even if they feel tired. After learning in the field trip, the students are expected to have an understanding of other religions, and have mutual respect between religious communities. In addition it would allow them to live in harmony with people of other faiths. That the values obtained the students in the learning field trip this time. In addition, other benefits of learning with field trips that students have direct experience. They can meet with speakers, so it can communicate directly with him. The students were not bored. Physically they became healthy, because moving to and fro. On March 26th, 2012, the students of the ICP studied at Santika Premier Hotel. They learned about the international table manner. Actually they did not only learn the international table manner, but they applayed some leason that they got in the class in Santika Hotel. They learned mathematic, science, art and culture. Mr. Bimo and Mr. Harmanto welcomed the students. Mr. Bimo is a Food and Beverage Manager of Santika Premier Hotel, and Mr. Harmanto is an Instructor at Santika Premier Hotel. Before starting the agenda, the students were divided into eight groups. Every group consisted of six until eight students. They stayed together on one table. They were very interested with that season. 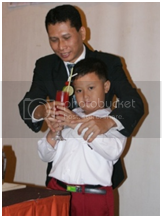 In this season Mr. Harmanto explained about the table manner. He said that table manner is knowledge on how to eat and to serve. It has become more important whether we are invited to banquet or as a host. In this moment the students also showed their creativity of art. They sang the song together, and story telling about something in English and in Indonesian. After the season, the students joined tour to Hotel. They saw the hotel room, the swimming pool, and the others. They looked very happy. All of the students get the certificate. The certificate is given to the students as a participant of training on the international table manner course. Field trip events are a very enjoyable learning activities. The students would love it, because it is very exciting. In enriching the learning process, children can play and have refreshing. Recently, the second grade of ICP of SD Hj. 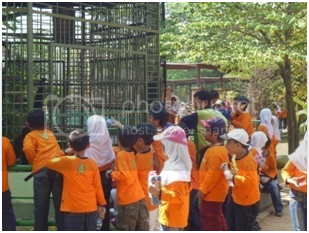 Isriati held a field trip to the zoo in Mangkang. In the event, the teacher designed a thematic contextual learning. Themes of learning is the Environment. In this theme, the teacher combined four lessons in one activity. All four subjects combined were Science, Mathematics, Indonesian, and Sports. Basic competency of science lesson was to classify the animals. While basic competency of Mathematics was to carry out the sum. The basic competency of Indonesian Language was writing poetry. And the basic competency of sport was doing agility. Applied learning methods were observation, experiment, and giving assignments to students. While the assessment of the learning was done with performance assessment, written assessment, and assessment of student performance results. After learning the students were expected to classify groups of the animals, add two numbers, write poetry, and had the physical dexterity. Character expected of students in the learning this time was that students had the responsibility of character, discipline, conscientious, brave, cheerful, and tough. Field trip events was success this time, because it was handled by ICP with a good team. As the slogan of SD Hj. Isriati is "Coming together is beginning, keeping together is progress, and working together is success. The first scenario of the study was observed the animals. Before observing, the students were grouped into three groups. Each group consisted of 20 or 21 students. Each group was accompanied by two teachers. The purpose of learning was to classify the animals. By observation, the students were expected to classify the animals based on their classification. 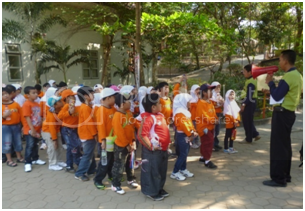 The students loved to perform surveillance activities. They observed directly the various animals. They walked around the animal enclosures. With fun, they recorded the animals one by one. 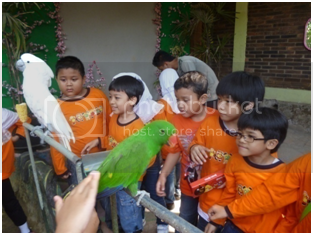 From observations at the zoo, the children encountered a variety of animals. However most animals there belongs to the class of vertebrate animals. The children were grouped into several categories, namely class reptiles, mammals and aves. Groups of animals that belongs to reptiles are snakes, crocodiles, and lizards. Animals belongs to mammals are tigers, elephants, orangutans, monkeys, bears, deer, antelope, buffalo and cows. While that belongs to aves or birds are peacocks, parrots, cassowaries, turkeys, geese and pelicans. Children wrote the observations result on the student worksheet. In addition to writing animals classification, the students also calculated and added up the number of certain animals. At the end of the assignment, students wrote a poem. The poem was written in the Indonesian language. The theme was about the environment in a zoo. Apparently kids grade 2 ICP were skilled at writing verse. The title also vary, there are titled "Elephant", "Tiger", "Parrot" and so on. How happy the teachers were when they saw children learning with fun and excitement. The students did the work right on time. No one among the students felt tired. After working on the worksheet, the students carried out bound activities and other activities that were recreational. Among them were riding an elephant, playing flying fox, swinginig, climbing, climbing aboard, and riding the train around the small lake. Now the children began to recognize the tomato plants. Children also got to know the body parts of the tomato plant. Body parts of the plant are the roots, stems, and leaves. The roots of plants serves to absorb nutrients from the soil. While stem serves to deliver nutrients from the roots to the leaves. And leaf extract works to cook food or photosynthesis. The students were very excited, got lessons on plants. In addition to tomatoes knowledge, the students also got to know other vegetables such as long beans, eggplant, and cabbage. Once familiar with the plant and its parts, the students learned to plant crops. This time the students learned to plant tomatoes. Apparently the students loved to learn science in these activity. The first step was setting up the tools and materials needed. Tools and materials were prepared, including plastic cups, a former drinks, loose soil, a small shovel, and a tomato plant height of 10 cm - 15 cm. Once preparation was completed, then the plastic cups half filled with loose soil. These step took the tomato plants from the nursery, and then put in the plastic cup. Once the roots got into the plastic, then reinserted the loose soil until it was full. Then the soil was compacted. Then became a new plant in a new place. At the end, the students named respectively, and brought back to raise. In learning science, teachers inculcated scientific attitude, the attitude of loving nature and the environment, curiosity, and most importantly, the students recognized the power of the creator. Thus students could grow and developed intellectual intelligence, emotional, and spiritual. What do you know about the "caping"? Caping is a hat made of woven bamboo. It is a cone-shaped hat. Caping is worn by farmers when they work in the fields or in the garden. 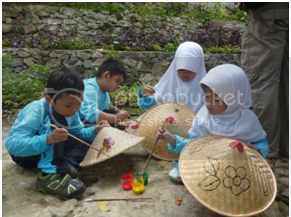 Once the students of ICP first grader went fieldtrip to Sekatul. This fieldtrip purpose was to know hat. 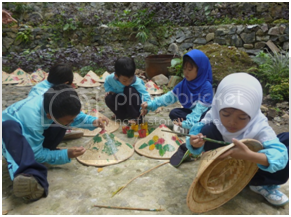 Hat is the result of handicrafts in the village Limbangan Boja, Kendal. In addition to familiar, students were also invited to paint on the hat. Before painting the students prepared the tools and hat to be painted. The tools were a paint timber, brush, oil, and a hat. 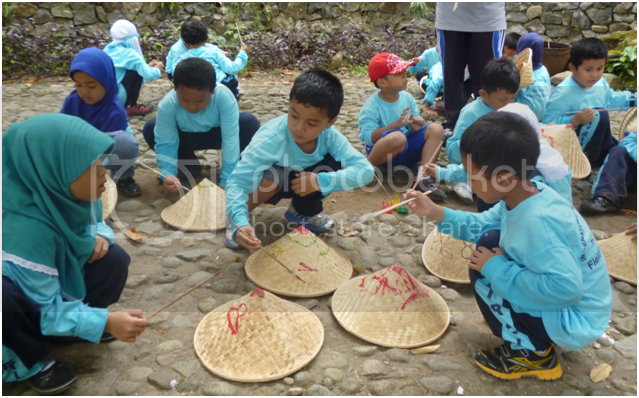 Once the equipment was ready, the teacher explained how to paint on a hat. Then the students practiced the teacher's explanation. Prior coloring, Mrs Agustin draw images preferred by each student. Once the picture finished, then students started coloring with paint. The students worked on the task so calmly and they looked busy in doing their job. Just occasionally they showed their works to the teacher. Despite their simply images, the students were good at combining colors. The female students created very harmonious blend colors on the hat. The male students were no less good. Apparently the students did not take long time to paint the hat. Approximately half an hour, many students completed the works. When finished coloring, the hats were dried in the sun. The students were relieved that a series of field trip on that day finished. And the teachers could see whether anyone has the talent to paint. Then teacher gave the value for these learning skills. Once the students got to know the classification of animals in field trip months ago, now they learned about plant classification. To know better about the classification of plants, the students were invited to a garden Holtimart in Bawen. Field trip this time brought a different atmosphere. The teachers designed learning that was active, creative, and fun. The students studied in the garden, with a medium wide variety of plants. As we know that children in large cities usually do not have a garden. So when they were invited to the garden they felt happily. Moreover, the students also enjoyed the results of the orchard. Once entering the plantation, the students carried a special car. They were taken around the garden area of 25 hectares. 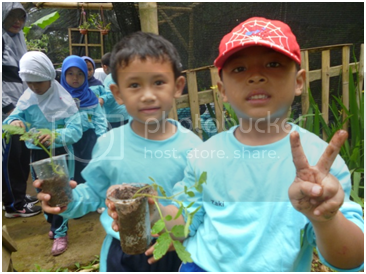 One by one plants were introduced to the students. There were varieties of vegetable crops, fruit crops, and so on. In addition, the students were also introduced to dichothyle plants and monochothyle, and different way in breeding. Then they were taught how to breed plants guava. Guava plants can be propagated by seeds, grafting, and graft. 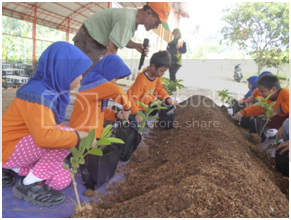 At that time, students learned about cashew plant, by moving into a polybag seedlings. 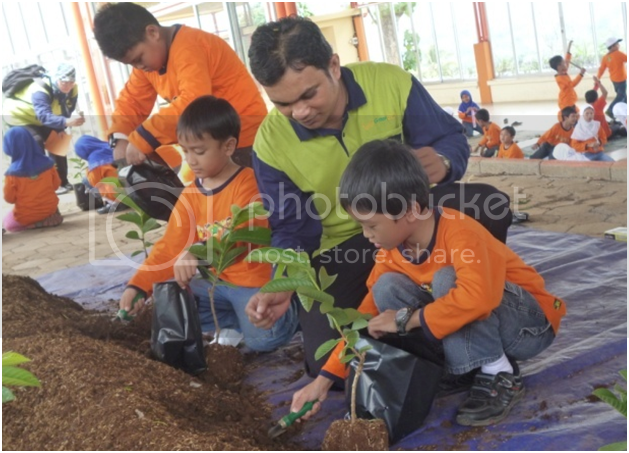 Following the practice of planting cashew seedlings, students were invited to a guava orchard. 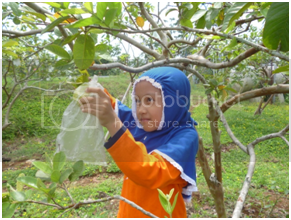 They were given the opportunity to pick fruits that were riped guava. And finally, the students were given guava juice. Gladly they enjoyed the fresh guava juice. In this lesson the students knew how to cultivate the soil, planting, tending, harvesting fruit, and enjoyed the results. Wonderfully, this was a very valuable experience for students.